Freeze any excess eggnog in an ice cube tray and add a couple of cubes to a glass of rum for a modern take on eggnog. 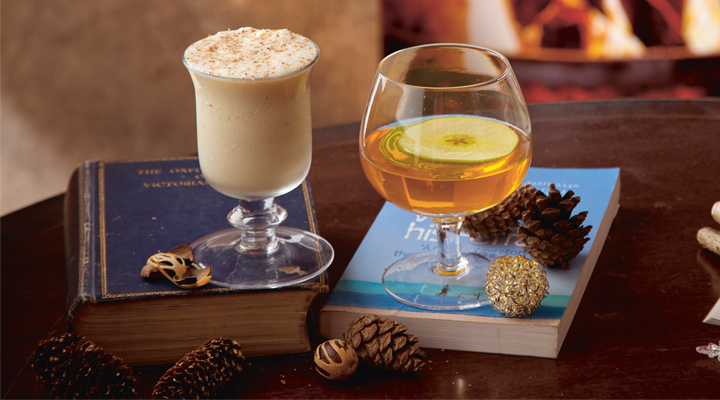 The day before making the eggnog, smash one nutmeg into several large pieces using a pestle and mortar and add to the rum. Cover and leave to infuse in a jar. To make the eggnog, grate half of the other nutmeg into a large saucepan. Save the other half for serving at the end. Add the milk, cream, cinnamon sticks and the vanilla pod and seeds. Bring to the boil over a medium heat, then remove from the heat and allow to infuse. Put the egg yolks and sugar in a large bowl and whisk until pale and fluffy. Strain the infused milk through a fine mesh sieve, then slowly whisk in the milk and continue to mix until everything is combined and smooth. Strain the rum, then stir that in too along with the sherry. Refrigerate overnight or for up to three days. Before serving, beat the egg whites into soft peaks in a large bowl. Gently fold into the eggnog until combined. Pour into pretty serving glasses and decorate with freshly grated nutmeg.